Control valves are critical components in plant operations around the world. To optimize operational integrity, valves require proper maintenance. Long-lasting Krytox™ synthetic lubricants keep valves operating smoothly with less maintenance. Krytox™ lubricant oils and greases can also provide long-term corrosion resistance and enhanced performance, even in harsh environments, as well as extending the wear life of valve seals. High lubricity, perfluoropolyether- (PFPE-) based Krytox™ performance lubricants are chemically compatible with all seal materials typically used in industrial applications. Krytox™ lubricants provide smooth valve operation, less re-lubrication, and field-proven performance that can save you time and money. And, they are ideal for demanding conditions—high and low temperatures, extreme pressure, and harsh environments. An American electricity generating company avoided costly shutdowns due to dried-out grease in its steam turbine governor control valves when they converted to Krytox™ lubricant grade XHT-BDZ grease; the switch also improved the reliability of supply to the electric grid and enhanced the bottom line. A Korean valve manufacturer was able to reduce damage claims to its pilot-type solenoid valves by applying Krytox™ oil grade GPL 103 to the solenoid coil in the assembly to reduce friction and heat, and coating the spools and seals with Krytox™ grease grade GPL 223 to resist degradation from water and oil. A South American manufacturer of big-bore engines used Krytox™ grease grade XP 2C5 to lubricate its EGR valves. The special additives in Krytox™ XP 2C5 prevent corrosion and allow free movement of the metal-to-metal mechanism; the grease is inert to nitrous oxide gas and withstands temperatures up to 160 ºC (320 ºF). A French airport authority using Krytox™ grease grades XP 2A3 and XP 2A5 was able to achieve annual savings of €15,000 to 20,000 on the maintenance of its jet fuel pipeline by reducing scheduled maintenance to every 30 months instead of every four to six months—and unscheduled shutdowns due to valve failures were eliminated. A German manufacturer of gear-operated exhaust gas recirculation (EGR) valves for the automotive industry reduced failures due to excessive separation of grease and oil that were occurring at low temperatures and heavy vibrations. 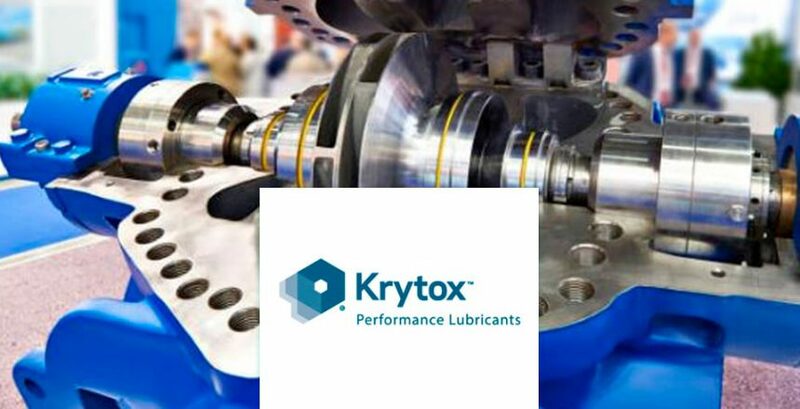 Switching to Krytox™ grease grade GPL 216, the manufacturer was able to improve the reliability of its EGR valves and estimates that it is saving €80,000 annually. For a steam control valve application at an Icelandic power plant, standard hydrocarbon-based grease proved unsatisfactory for lubricating bushings for valves that control the flow of high-temperature steam containing corrosive geothermal gases. The optimum lubricant would need to withstand the acidic gases and have low friction for accurate control of the valve position, as well as be capable of performing in a selfgreasing system. Krytox™ GPL 206 grease met the challenge for lubrication of the steam valve bushing, providing the low static friction and no stick-slip that is required for accurate position control.